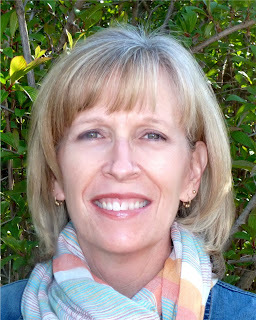 The Writers Alley: Interview with Patti Hill and book-launch giveaway! Interview with Patti Hill and book-launch giveaway! Today we welcome Patti Hill, one of my all-time favorite voices in Christian fiction. When you pick up one of her books, you’ll see why. She has a fresh, beautiful voice – lyrical without being ostentatious, heartfelt and whimsical and easy to read and emotionally complex all in one. Oh, and did I mention funny? It’s no wonder she’s multi-published and a Christy award finalist. Not only that, she’s just the sweetest person you’ll ever meet. I’m so thrilled to have her with us at the Alley on this extremely exciting day! Bio: Patti Hill is an unlikely novelist. Books played only a small part in her life until her high-school years. And she only remembers her mother reading to her once. Her mother’s voice flowed like water. Always resistant to sleep, young Hill created stories to entertain herself until stories of galloping Arabian stallions and pirate ships segued into dreams. That was the beginning. Then she discovered people enjoyed hearing her stories—real or imagined. She loved having an audience. Still does. She didn’t think to write a story until she read a novel so beautiful that when it ended, she was bereft. A passion to orchestrate words, characters, and stories consumed her. Fortunately, she’d married a man who thought leaving a good-paying career to write novels was a splendid idea. In other words, she is a kept woman. Happily so. In Colorado. She is the author of six novels. Writing is one way she worships Papa God. Welcome, Patti! We’re going to pick your brain a little today. Goodness & Mercy is your first historical fiction. What challenges did you face in this new genre? I had a terrible time stopping the research phase. I interviewed people, picked peaches, spent hours in the oral history department of the local museum, anything to get into the skin of the people who lived during WW II and insert myself into their lives of the people of Palisade, Colorado. I met the most amazing people, like a 95-year-old man who ascended Mt. Belvedere with the 10th Mountain Division. Everyone was generous. The bonus was learning so much about my own valley. I can just about smell those sun-warmed peaches. You actually make research sound like fun. (Can you tell I’ll never be an historical fiction author? Love reading it, but phew – hard work for the author!) Why did you decide to try historical fiction? Over the years, my mom had asked me repeatedly to write her story. Writing my family’s story, including six siblings and all of their children, scared me to death. There were too many perspectives on what had happened. So, I borrowed the premise of my mom’s story. In 1946, my grandmother was declared an unfit mother, and my grandfather was institutionalized for a mental breakdown. At sixteen, my mom quit school and set about being breadwinner and caregiver to her six siblings, ranging in age from 2 to 14. The state eventually stepped in and took her siblings to orphanages. Although dispersed, Mom managed to keep her siblings a family. I have relationships with all of my aunts and uncles. Thanks to Mom, we are a family. I love the tenacity Mom demonstrated, and I put that quality in my main character, Lucy. She has twin siblings, Goody and Mercy, a boy and girl, when her parents are killed. Lucy tries to be all the twins need, but the state steps in and the 8-year-old twins head off for an orphanage. When a farmer and his wife decide to adopt Goody, the question becomes: How far will Lucy go to keep her shrinking family together? I love your premise. The fact that it’s based on a real-life story is goosebump-worthy. What a rich vein of family lore you have to mine. Okay: let’s get down to the nitty gritty. What is your writing day like? Since I work in my home, I like to have my ducks in a row before going to my desk. For me, that means time with Papa God. I talk back to Him daily in my journal. It’s a great time. Then I take my Australian shepherd, Tillie, for a long walk. We both need to work out the kinks. Once I’ve cleaned up, I do a household job, and then it’s off to work. I unplug the phone, look at the pages I wrote the day before, and write three more. It’s amazing how quickly the pages add up. When I reach my writing goal, I’m out the door to meet a friend for a cold drink or spend time with my dad. This is how I regenerate. Sounds like you’ve achieved a great work/ life balance. Did you always want to be a writer? Heavens, no! I told my 8th grade math teacher I didn’t need to solve for X because I was going to be an entertainer. I left my ingénue stage in time to marry and have two sons, so I stayed home with the boys for most of their growing-up years before I returned to college for my literature degree. I was born a teacher, so I taught elementary school for a while. But I’d read that beautiful story. And I couldn’t think of anything else I wanted to do. I quit teaching—the original plan was for a year—but I hadn’t even written the first page after one year. I was discovering that writing was hard work. I buckled down, got the first chapter written. Within months, I had a book contract for Like a Watered Garden. You realize we all hate you right now. Or at least, we would if you weren’t so completely loveable. Seriously, it’s a credit to the caliber of your writing that you snagged the attention of a publisher so quickly. I’m impressed. What advice do you have for aspiring writers? Don’t make publication your goal. Make writing God-honoring stories your goal. Be willing to put the time and sweat it takes to be a good writer. Take classes at your local college or attend writers conferences to hone your skills. Keep learning. Never be satisfied, but never go safe either. Above all, persist. Persistence is the secret ingredient to being a good writer. And one more thing I wish someone had told me: Start small. Write short stories or novellas. They’re a great way to experiment with ideas, and if your experiment tanks, you haven’t lost all the time and effort a novel requires. Great tips, Patti. There’s a lot to chew on there. I’m so pleased you could come and hang out with us today. Isn’t she lovely? So here’s the lowdown. To win a SIGNED paperback copy of Patti’s novel, please comment below with why you would like to read Goodness & Mercy. One winner will be announced in the weekend edition. If you win, you can keep one and give the other as a gift to a book-loving friend. Or keep it just to sniff the pages (I know you still love the smell of paper and ink, even if you ARE a Cool Kid with a Kindle). Or leave it casually lying around on your coffee table, open to the autographed flyleaf, so everyone can be suitably impressed by your authorial connections. Whatever the case, we are determined to get Patti’s newest novel into as many hands as possible, so get commenting and get clicking! And if you read it and enjoy it, please help spread the word by writing a review or recommending the book to a friend! I am here to tell you that this book is perfectly lovely, the kind where you want to jump right inside the setting and hang out with the characters. I will definitely be reading it again someday and have recommended it to all my friends. Way to go wanderer! Thanks so much for stopping by to give a shout-out to Patti on launch day! Wow, Patti! Your mother is a brave and courageous woman. Her story sounds amazing! I love the title! What a brave woman and I love that she was her inspiration. I also write stories set in that era, inspired by people who lived courageous lives in a tenuous time. Thanks for reminding there are others out there who love the time and the research! I loved this interview! I am always so impressed by authors who were able to get published quickly...you must definitely have a gift! I just downloaded the book and can't wait to dive in! Thanks for your kind comments, especially about my mom. She passed away just over a year ago, and I miss her terribly. 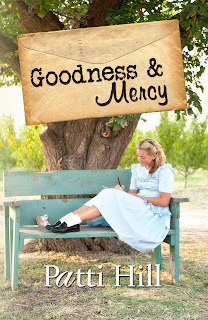 She read an early version of Goodness & Mercy. Julie and Sherrinda, thanks so much for sharing! And Sherrinda - YES - Patti has buckets of talent! A very gifted writer. She deserves a broad audience for her books. Never be satisfied and don't go safe. Wow. And what a great publication story! Great gems in here. Thanks, Patti and Karen. 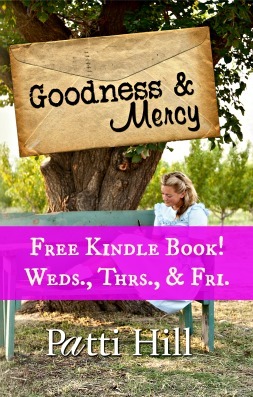 Thanks for the notice about the free e-book! I've already downloaded a copy and will read it soon. I've tried my hand at historical fiction too, and know how easy it is to get bogged down in research! This sounds like a good one, and I'm looking forward to reading about that era, and especially that family. Love this story. My mother was the youngest of 6 taken out of their home in either late '40's or early '50's. Their parents were both alcoholics. During the school year, Mom was sent to a residential school for the blind. She was amazing though and inspiration for my first novel Night Blooming Jasmine. It is fiction although i do draw from her life. Her character goes blind as a young adult and i still cry when i read the scene where she wakes up in the hospital and can't see. What a wonderful story! Downloaded and can't wait to read!